Hi, my name is Molly, and it has been roughly two hours since I last touched a smartphone. That tiny black rectangle can give me instant answers to all the above. It’s handy for staying up-to-date on work email, receiving notifications from sports and news outlets, listening to podcasts, and more. But guess what: it’s more than just handy. Pulling out one’s phone for any of the above is actually creating a chemical reaction within our brains. Research is showing that this instant gratification of achieving a goal actually releases dopamine into our brains — the same neurotransmitter released by many addictive drugs. My problem? Too often I don’t stop after the one initial task. Checking email may lead to perusing social media, which may lead to far-too-much time looking through the lives of others, learning things that could (and maybe should) be saved for actual human interaction. I know I’m not the only one. In fact, in a study by British researchers in which a time-tracking app was installed on cell phones, it was found that young adults between the ages of 18 and 30 spend an average of five hours each day on their smartphones. That may not be your norm, but it does point toward a growing trend. Here’s the crazy thing. I don’t even actually own a smartphone. I just happen to have a husband who leaves his lying around, and I have become accustomed to encountering the world through this tiny device. If I like using his smartphone, why don’t I get my own? Well, the thing is, I don’t really like who I am with a smartphone. This habit of instant gratification through pocket-ready technology doesn’t actually make me happy. When I balance the scales, although smartphones do have their practical uses, it doesn’t make my life easier. And it certainly doesn’t add purpose to my life. I know myself well enough to know that, if I had a smartphone, I would join the ranks of the 18 through 30 year-olds mentioned in the study above. Too easily, we form relationships with these devices. They become an avenue for conversation, our way to get around town, and an opportunity for quick answers to everything from “is this poison ivy?” to “what are those song lyrics?” and anything else we may need to know. There are even a plethora of faith-based apps that can offer enrichment to our spiritual lives. But there is a flipside. I know that, personally, if I had this digital world of instant knowledge and gratification at my fingertips, I would be living in part on the island Pope Francis mentioned above. 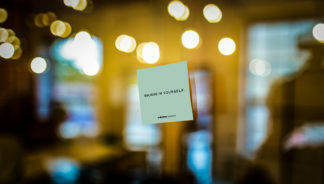 Being disconnected facilitates connection. Because I am not in the habit of checking my dumb phone, it is almost always tucked away and silent. When I see a smartphone sitting on a table, it tells me, “what you’re saying is important, but it’s also possible that something else more interesting to me may happen on my phone, and I want to be ready just in case.” When I meet with people for coffee or lunch, I want them to know that they (not my phone) are my priority and have my full attention. I opt into things like news and sports scores rather than having them passively appear on my screen and hook me in. There is no “smartphone wormhole” in my life. You know the routine: you sit on the couch, pull out your phone, and next thing you know, nearly half an hour has passed, and unintentionally so. That’s not even possible on my phone. My relationships are forced to be more in-person, steering away from the island Pope Francis referenced. Texting on my dumb phone takes more time than it’s usually worth. I spend little (albeit still too much!) time on social media. Because of this, I catch up with friends in person or, if far away, over the phone. Fostering a habit of presence has had a direct benefit on my spiritual life. While I still struggle with distraction, I, at the very least, do not find myself driven by that habitual urge to check my phone. I do not spend much time thinking about documenting and painting a portrait of my life. Without a camera and social media at my fingertips, there’s not a whole lot I share online (the only platform I use is Facebook). And sure, years ago, I put too much thought into how I want others to perceive me (rather than who I actually am). But, since then, while I’ll hop on Facebook a few times a week, my profile largely just sits there. I focus on sharing my life with people in person, instead. Whether you’ve joined me in dumping your smartphone, or if you’re technologically savvy and benefit from these handy (I’ll admit!) 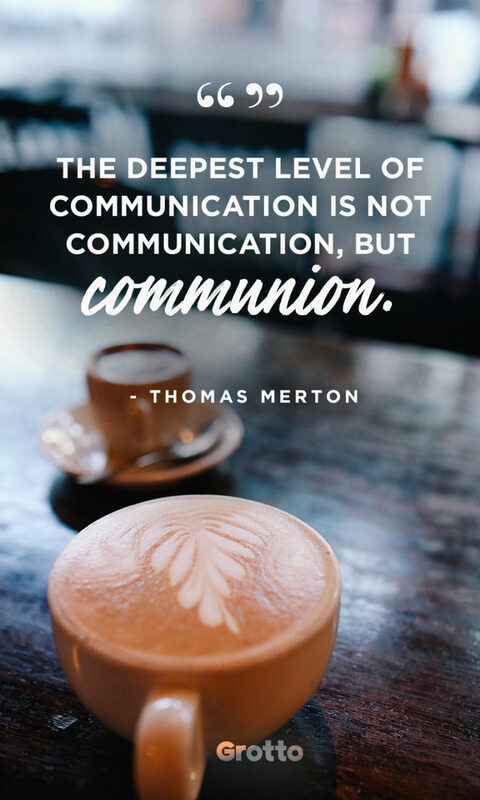 devices, let us pray that we can work toward Thomas Merton’s vision of authentic communion, in which we have the time and space to be who we were created to be.